Bibinger's is a gastropub in West Bend, Wisconsin serving scratch cooking and hand-crafted drinks. Bibinger's is truly "old meets new" serving a new take on classic Wisconsin food and drink while housed in the historic 170-year-old Bibinger's Building. 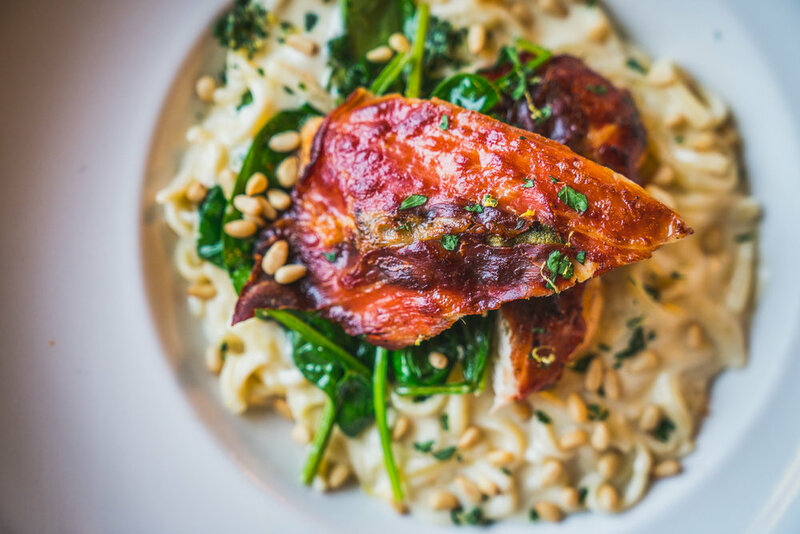 The food at Bibinger's is made with nothing but the best local, seasonally-inspired ingredients and our full-service bar has something for everyone, from craft cocktails to local brews. Bibinger's is continuing those traditions shared by the local community through the years and looking forward to making new ones too. 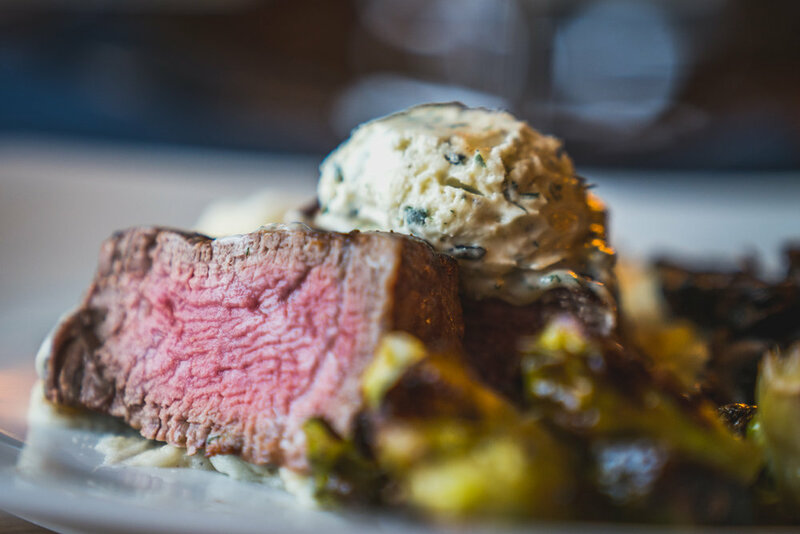 Our menu offers food for any occasion, from scratch-made appetizers and sandwiches to our signature entrees of steaks and seafood. Bibinger's offers the perfect private event hall to host any party! Call us at 262-416-3436 to learn more. The history of this building is built on a foundation rich with friends, laughter and a terrific sense of community. From generation to generation, these traditions have been carried forward and passed down from operator to operator. Johann Bibinger was the one that started it all in 1846. He built the original structure to provide Cedar Creek with a general store, saloon, and hotel, call the Bibinger Hotel and Dance Hall. Historical records reflect that the building switched hands multiple times over time. In the 1920's it was called the A.B. Mueller Hotel and Sample Room. Back in the day, a sample room allowed patrons to see samples of merchandise before they ordered it including dresses, hats and shoes. A slaughter house was added to the location by Albert Heidtke to offer the community fresh local meats. The next proprietor was Peter Gruehl, who ultimately sold the property to Joe Schwai Sr. The Schwai's held it in their family name for the longest to date, a total of 64 years starting in 1941, handing it down through three generations ending with Tommy & Kathy in 2005. The Schwai's and its patrons made this building legendary - hosting weddings, fundraisers for local charities, Tiddlywink tournaments, as well as the famous O'Schwai's St. Patrick's Day parties. It is wonderful listening to all of the stories that past patrons have to share, their smiles reflecting the laughter and good times had by all. Luann and Joe Jr. were giving, kind souls, making all feel like family. Luann especially, by greeting everyone with "Hello Sunshine!" from behind the bar. The Schwai’s family business continued, however chose to focus on their meat market and moved off site. In 2005 Emily's opened, owner Tommy Kraus purchased the building naming the establishment after his daughter. That business switched locations, leaving the building vacant and its future uncertain. Kevin and Amy Zimmer purchased the building in 2013. Renovations began of the original structure as well as its five additions that were added over 160 years. Breathing life back into Johann’s original dream, they prepared it for a minimum of another 100 years of service to the community. In 2016 the next chapter in the rich history of this building begins. Named after the originator, Bibinger's is excited to continue to build on the established traditions by ensuring good times, great food and outstanding service. Thank you for joining us and adding to this buildings already rich history.